John Moten catches a pass. The redshirt-freshman running back was named co-Big Ten Freshman of the Week after his performance against Purdue. John Burroughs School has been blessed with two dominant running backs in the past six years. One is Ezekiel Elliott, later a national champion at Ohio State and currently the NFL’s season rushing leader. 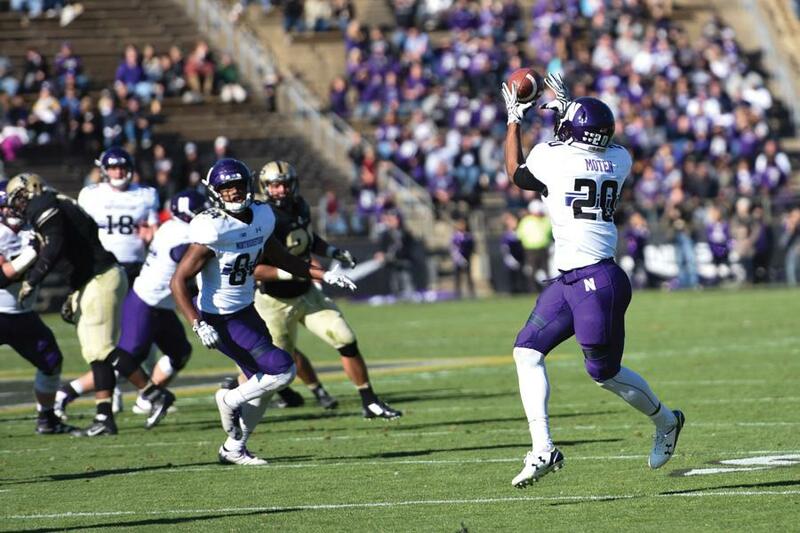 The other is now-Northwestern redshirt freshman John Moten IV. “We both play running back, and we both love football,” Moten said with a laugh when asked Monday what he and Elliott had in common. But at the St. Louis high school, such comparisons were no joke: Elliott rushed for 3,957 yards and 74 touchdowns in the 2011 and 2012 seasons, then Moten ran for 4,272 yards and 63 touchdowns in the 2013 and 2014 seasons. The latter may never quite match the former’s success at the collegiate (or professional) level, but Moten has nonetheless capitalized on unexpectedly plentiful playing time this season to establish himself as the Wildcats’ next every-down workhorse once Justin Jackson graduates in 2018. Functioning as the Cats’ No. 2 runner ever since projected backup Warren Long, a senior, suffered an injury in the season opener, Moten has carried 39 times for 201 yards — an impressive 5.2 yards per carry average — but had a single-game high of just 26 yards until a week ago. Last Saturday in West Lafayette, Moten exploded for 119 yards on 16 carries as NU derailed Purdue 45-17. He fell just eight yards short of Jackson in rushing yards and, including a 20-yard reception, exceeded him in total yards. He earned Big Ten Co-Freshman of the Week honors for his performance. The spike in playing time allowed Moten to showcase what Jackson and running backs coach Matt MacPherson have taught him in practice all year: to trust his instincts and ingrained playbook knowledge and commit all of his energy to using his natural skills. Moten certainly has speed. At Burroughs, Moten was a state champion in track, running the 100-meter dash — longer than the length of a football field — in a Missouri-best 10.58 seconds. So when he arrived in Evanston, he knew how to run and carry a football but not as much about the rest of the running back position’s responsibilities. Fitzgerald said that Moten is now “starting to come on” in those regards, and he’s seeing more playing time as a result. Against Purdue, 13 of Moten’s 16 carries came after halftime, and he displayed his versatility using his speed to break two of them for more than 25 yards, shedding tackles or overpowering defenders to gain extra yards on several more and patiently waiting for blocking lanes to develop on others. He said the steady workload allowed him to develop a rhythm, and it showed. Another 119-yard eruption is unlikely this weekend: Minnesota’s run defense ranks 22nd in the nation, and Jackson remains the Cats’ undisputed No. 1 back. But in Moten, NU now has a reliable and explosive change-of-pace option to turn to when needed. And come 2018, when Jackson graduates and leaves a void in the depth chart, the Cats will have Moten waiting in the wings, ready to fill a great predecessor’s massive shoes once again.